When Bryan Dewsbury was a STEM graduate student at FIU, he had many opportunities to pick up tips and lessons about interactions and relationships within his department. Now, those lessons are influencing how he approaches those types of relationships as a faculty member. Bryan is an assistant professor in the Department of Biological Sciences at the University of Rhode Island, and he wants to improve science education. Bryan initially chose to attend FIU because he wanted to pursue a career related to marine conservation, and FIU had several labs doing work that was loosely related to the subject. “Honestly, since it was going to be a marine focus, I wanted to dive somewhere where the water actual gets warm,” Bryan says. He’s originally from Trinidad and Tobago, so Miami’s proximity to Trinidad by plane was also a major contributing factor. Bryan’s experiences at FIU have contributed to his success as a professor in varied and unexpected ways. He was the Head TA for the QBIC (Quantifying Biology In the Classroom) Program. QBIC is an FIU academic program that emphasizes the study of living systems and the critical evaluation of biological concepts. “I think none of what I do now would have been possible had it not been for the fabulous students, faculty, and staff I had the pleasure of interacting with during my time in the program,” Bryan says. 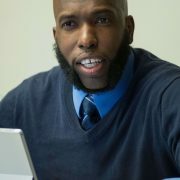 Besides QBIC, other experiences as a graduate student, such as his involvement with the Scholarship of Teaching and Learning, have directly influenced Bryan’s work as a professor. SoTL seeks to improve teaching by examining student learning in the classroom and making the findings public. 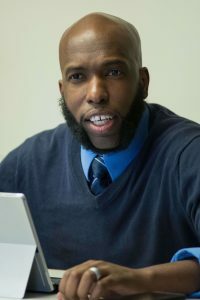 With support from the Center for the Advancement of Teaching and Learning, Bryan was able to engage in the Scholarship of Teaching and Learning (SoTL) as a graduate student. “I had the good fortune of doing ‘professor type’ things that [were] formative to what I do now,” Bryan says. In addition to SoTL, he sat on search committees, conducted workshops on curriculum design, and designed curricula. Bryan earned a PhD in biology from FIU in 2014. Prior to that, he earned an MS in biology from FIU and a BS in biology from Morehouse College.